Looking for a cabin to stay in while visiting Gatlinburg and Pigeon Forge TN? Our affordable 2 Bedroom Pigeon Forge and Gatlinburg cabins are ideal for couples and family vacations in the Great Smoky Mountains. "Close Enough To Perfect" is a beautiful 2 bedroom cabin close to downtown Pigeon Forge and just a short drive to the quiet side of Wears Valley and Townsend. Your family will absolutely love this 1-level cabin and all it has to offer! Upon arrival you will be welcomed with a convenient carport and large front porch with wooden rocking chairs and swing, perfect for relaxing in the Smoky Mountains. Cabin is NO SMOKING and NO PETS! Deer Wood Cabin is a cozy 2 bedroom cabin tucked away in a wooded area. Close to Dollywood, Dolly Splash Country, restaurants, shows and shopping! Each bedroom and living room has a flat screen TV. This cabin also features WiFi, Jacuzzi Tub and Hot Tub. Open loft features a king bed, flat screen TV and bathroom with a Jacuzzi tub. THIS CABIN IS NOT PET OR SMOKE FRIENDLY! 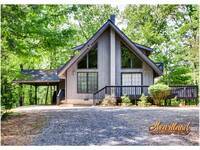 Sweet Dreams is a beautiful 2 bedroom and 2 bath log cabin located near Gatlinburg, TN. This log cabin features the best in amenities for your perfect family vacation, anniversary getaway or romantic honeymoon. This 2 bedroom and 2 baths cabin near Gatlinburg is located in a beautiful wooded area with a running creek. Lush greenery is set in a spectacle of Irish charm. This cozy cottage is filled with all the accommodations you need. Two flowing creeks rush on either side of the island, creating the perfect place to try and spot a Leprechaun! 2 Bedroom 2 bath Cabin near Gatlinburg. Above the Clouds is a beautiful log cabin with a nice view of the Smoky Mountains. In this private location, you can enjoy a relaxing time in the hot tub on the back deck looking at the view of the mountains... THIS CABIN IS NOT PET OR SMOKE FRIENDLY! Mountain Breeze is a 2 bedroom and 2.5 bath private cabin. This cabin is ideal for a family vacation or just a weekend getaway tucked away in the Great Smoky Mountains in a quite peaceful surroundings of the woods. The kids will enjoy the loft with its own half bath, pool table, TV, and hideaways for sleeping. Amazing Views -The name says it all! You will receive the perfect mountain view at this Gatlinburg cabin rental. This 2 bedroom 3 bath cabin has King beds in each bedroom and a queen in loft area sleeps 6 people. THIS CABIN IS NOT PET OR SMOKE FRIENDLY! All of our 2-bedroom vacation cabins feature a minimum of 2 bathrooms and provide lodging for 4 - 6 people. There is ample living space and room to relax. Choose a Heartland Cabin Rentals in Pigeon Forge or Gatlinburg for a great vacation in a Smoky Mountain Cabin.